TACLOBAN | Philippine officials said Sunday that Friday’s typhoon may have killed 10,000 or more people, but with the slow pace of recovery, the official death toll remained well below that. The Philippine military confirmed 942 dead, but shattered communications, transportation links and local governments suggest the final toll is days away. Presidential spokesman Edwin Lacierda said “we pray” that the death toll is less than 10,000. Tacloban, the worst-hit city along the country’s remote eastern seaboard, resembled a garbage dump from the air, punctuated only by a few concrete buildings that remained standing. “I don’t believe there is a single structure that is not destroyed or severely damaged in some way – every single building, every single house,” U.S. Marine Brig. Gen. Paul Kennedy said after taking a helicopter flight over the city. He spoke on the tarmac at the airport, where two Marine C-130 cargo planes were parked, engines running, unloading supplies. Authorities said at least 9.7 million people in 41 provinces were affected by the typhoon, which is called Yolanda in the Philippines but is known as Haiyan elsewhere in Asia. It’s one of the most powerful recorded typhoons to ever hit land and likely the deadliest natural disaster to beset this poor Southeast Asian nation. Philippine soldiers were distributing food and water in Tacloban, and assessment teams from the United Nations and other international agencies were seen for the first time. The U.S. military dispatched food, water, generators and a contingent of Marines to the city, the first outside help in what will swell into a major international relief mission. Authorities said they had evacuated some 800,000 people ahead of the typhoon, but some of the evacuation centers proved to be no protection against the wind and rising water. The Philippine National Red Cross, responsible for warning the region and giving advice, said people were not prepared for a storm surge. The winds, rains and coastal storm surges transformed neighborhoods into twisted piles of debris, blocking roads and trapping decomposing bodies underneath. Ships were tossed inland, cars and trucks swept out to sea and bridges and ports washed away. 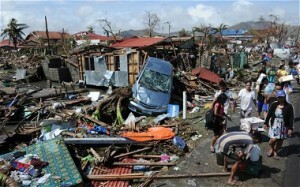 “In some cases the devastation has been total,” said Secretary to the Cabinet Rene Almendras. Residents have stripped malls, shops and homes of food, water and consumer goods. Officials said some of the looting smacked of desperation but in other cases items taken included TVs, refrigerators, Christmas trees and a treadmill. An Associated Press reporter in the town said he saw around 400 special forces and soldiers patrolling downtown to guard against further chaos. Philippine President Benigno Aquino III said in a statement he had a declared a “state of national calamity” allowing the central government to release emergency funds quicker and impose price controls on staple goods. He said the two worst-hit provinces, Leyte and Samar, had witnessed “massive destruction and loss of life” but that elsewhere casualties were low. Soldiers stand guard outside one of the Daka stores that the Venezuelan government seized. CARACAS | Thousands of Venezuelans over the weekend lined up outside the country’s equivalent of Best Buy, a chain of electronics stores known as Daka, hoping for a bargain after the socialist government forced the company to charge customers “fair” prices. President Nicolás Maduro ordered a military “occupation” of the company’s five stores as he continues the government’s crackdown on an “economic war” it says is being waged against the country, with the help of Washington. Members of Venezuela’s National Guard, some of whom carried assault rifles, kept order at the stores as bargain hunters rushed to get inside. Televisions were the most in-demand item in the line outside one Caracas store, though people waited more than eight hours for fridges, washing machines, sewing machines and other imported appliances. Water and snacks were being sold outside the store by savvy Venezuelans keen to profit from the commotion. Happy customers weaved giant television screens and other items back to their cars through the crowds. Images circulating online as well as reports by local media appeared to show one Daka store in the country’s central city of Valencia being looted. 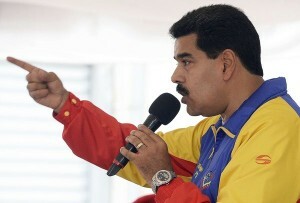 Maduro faces municipal elections on Dec. 8. His popularity has dropped significantly in recent months, with shortages of basic items such as chicken, milk and toilet paper as well as soaring inflation, at 54.3% over the past 12 months. Economists are expecting a devaluation soon after the election, likely leading to even higher inflation. The opposition, which has long struggled to gain ground against the country’s socialist government, is hoping that the elections will be seen as a referendum against Maduro. 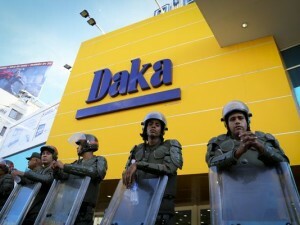 Daka’s store managers, according to Maduro, have been arrested and are being held by the country’s security services. Neither Daka nor the government responded to requests for comment. Maduro has long blamed the opposition for waging an economic war on the country though critics are adamant that government price controls, enacted by Chávez a decade ago, are the real cause for the dire state of the economy. With such a shortage of hard currency for importers and regular citizens, dollars sell on the black market for nine times their official, government-set value. Prices, at shops such as Daka, are set according to this black market, hence the government’s crackdown. Chávez often theatrically expropriated or seized assets from more than 1,000 companies during his 14-year tenure. This, among other difficulties for foreign firms, led to a severe lack of foreign investment in the country which, according to OPEC, has the world’s largest oil reserves. Not all were for the bargain hunting. One taxi driver screamed at the waiting crowds as he went past a Caracas branch of Daka, accusing them of “abusing” the system. 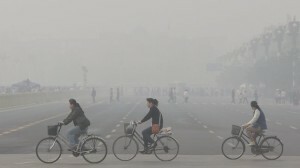 Chinese women cycling through polluted smog over Tiananmen Square in Beijing. …Last month visibility in Harbin dropped to below three metres [9.8 feet] because of heavy smog. On days like these, no surveillance camera can see through the thick layers of particles, say scientists and engineers. To the Communist authorities, this is a serious national security concern. Beijing has invested heavily to build up a nationwide surveillance network that lets police watch every major street and corner in main cities. Kong Zilong, a senior project engineer with Shenzhen Yichengan Technology and an expert in video surveillance technology, said the security devices that could function in heavy smogs have not yet been invented. The government has come to realize the seriousness of the issue and commissioned scientists to come up with a solution. 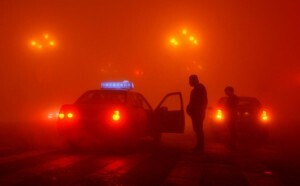 As well as health issues, heavy smog in cities such as Jilin is creating serious security concerns for authorities. The National Natural Science Foundation of China funded two teams, one civilian and one military, to study the issue and has told the scientists involved to find solutions within four years. Professor Yang Aiping, an expert in digital imaging with the School of Electronic Information Engineering of Tianjin University and leader of the civilian team, said she was facing tremendous pressure because of the enormous technological challenges. “Most studies in other countries are to do with fog. In China, most people think that fog and smog can be dealt by the same method. Our preliminary research shows that the smog particles are quite different from the small water droplets of fog in terms of optical properties,” she said. Professor Zhang Li, an image processing expert with the department of electronic engineering of Tsinghua University, said the researchers might have to think out of the box. “On the smoggiest days, we may need to use radar to ensure security in some sensitive areas,” he said. Microwaves or electromagnetic waves could travel through smog easily and bounce back if they hit an object. With the help of good software, sharp and clear images could be produced. But a radar camera would also generate radiation that harms people’s health. “It has to be a contingency device,” Zhang said. b) The typhoon hit Friday. What help was the U.S. military providing by Sunday? b) Socialist President Maduro blames greedy owners for inflated prices. What do Maduro’s opponents say is the real reason for inflated prices? b) How much time has the government given researchers to find a solution for the lack of visibility in smog? Haiyan hit the eastern seaboard of the Philippines on Friday and quickly barreled across its central islands, packing winds of 147 mph that gusted to 170 mph. It inflicted serious damage to at least six islands in the middle of the eastern seaboard. 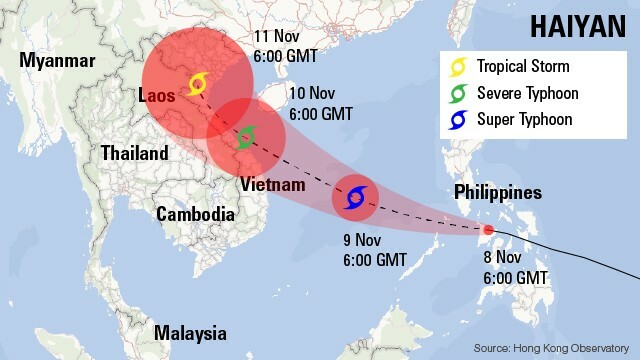 The storm’s sustained winds weakened to 74 mph as the typhoon made landfall in northern Vietnam early Monday after crossing the South China Sea, according to the Hong Kong meteorological observatory. Authorities there evacuated hundreds of thousands of people, but there were no reports of significant damage or injuries. It was downgraded to a tropical storm as it entered southern China later Monday, and weather officials forecast torrential rain in the area until Tuesday. No major damage was reported in China, though Xinhua News Agency said heavy winds tore a cargo ship from its moorings in southern China and drove it out to sea, killing at least two crew members. In his fight against the “economic war” he says the political opposition, in collusion with the United States, is waging against Venezuela, President Nicolas Maduro ordered the military occupation of electronics chains over the weekend and summoned the public to come shop at government-enforced “fair” prices. The orders against Daka, KVG and Krash, which are basically Venezuelan equivalents of Best Buy, sparked chaos at the stores’ outlets. The authorities arrested five store managers and said they will be prosecuted for unjustifiably raising prices. Pictures shared on social media as well as local newspaper reports said that one store in the country’s central city of Valencia faced looting. Some critics suggested that the entire operation was a form of looting organized by the government, just in time for municipal elections in December. Socialist President Maduro said government inspectors had found goods that were overpriced by as much as 1,000%. Daka’s owners have not responded to the allegations. But BBC Caracas correspondent Irene Caselli says goods at state-controlled stores are often very difficult to find and sell very quickly when available. She says state shops buy dollars to pay for imported goods at the official rate of around 6.3 bolivars per dollar. But private importers often complain official dollars are not readily available and that they must buy dollars on the black market at rates about seven times higher, our correspondent adds. The move against Daka comes after weeks of government warnings against pre-Christmas price rises. President Maduro often accuses wealthy businessmen of hoarding goods in order to push up prices. But critics of his government say economic mismanagement, rather than unscrupulous retailers, is responsible for inflation and shortages of basic goods such as milk and toilet paper. Correspondents say inflation, now running at 54%, has become an important issue in next month’s local elections. Growing economic problems in the oil-producing nation have dented Mr Maduro’s popularity.